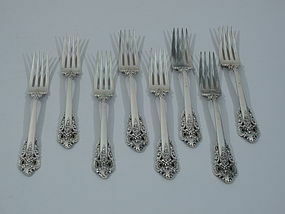 Set of 8 sterling silver forks in Grande Baroque pattern. Made by Wallace in Wallingford. The classic 20th-century American pattern that was first produced in 1941, after a design by William S. Warren. Crisp definition and good balance. Hallmarked. Condition: rich patina and attractive period wear. 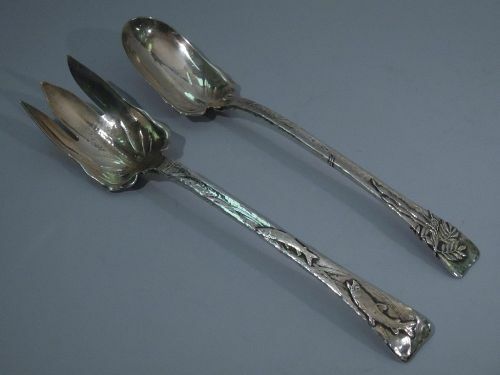 Aesthetic salad serving pair in sterling silver. Made by Knowles (later Mauser) in Providence, ca. 1880. Fork and spoon have tapering handles with acid-etched ornament of Japanese inspiration with crustaceans, birds, and branches. Spoon has round and crimped bowl. Fork has round and crimped shank with four tines. Bowl and shank have double-sided gilt wash. Hallmark includes retailer’s name A. Stowell & Co. Excellent condition. 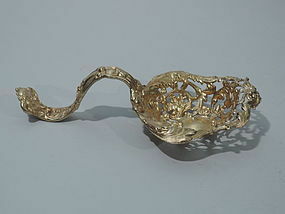 Gilt sterling silver bonbon spoon. Made by Gorham in Providence in 1898. S-scroll handle and round bowl. Bowl has central heraldic cartouche (vacant) and pierced foliage and flowers. Cherubs’ heads and scrolls on handle. Fine details and good heft. Hallmark includes date symbol and model no. A291. Excellent condition with richly mellowed gilding. 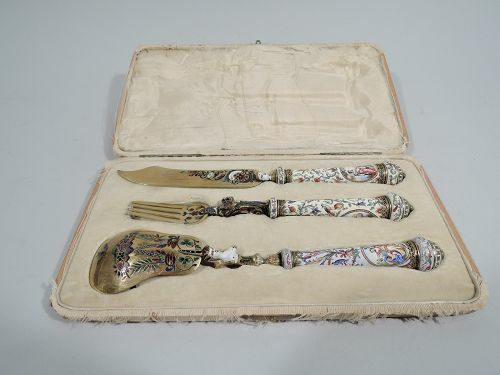 French 950 silver fish service, ca. 1910. Possibly by Georges Fouquet-Lapar in Paris. This service comprises 8 knives and 8 forks. The knives have a curvilinear blade. The forks have a long shank and 4 tines. Handles are tapering with applied scallop shell and beaded husk and terminate in cartouche with asymmetrical scrolls. Hallmarked. Excellent condition with nice patina. Art Nouveau server in 950 silver. Made by Am. Tallois in Paris. Triangular blade with flowers and insect in low relief, heightened and bordered with gold. Tapering handle with foliage. An elegant addition to the buffet. Hallmarked. Excellent condition. Length: 12 in. Weight: 3.8 troy ounces. 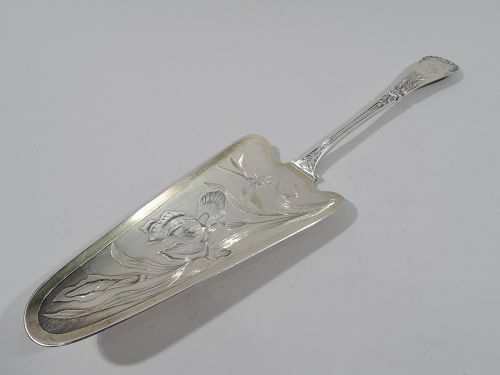 George III sterling silver fish slice with agate handle. Made in London, England in 1797. The blade is curvilinear with pierced ornamental arcade. The handle is tapering and faceted with scalloped silver mount. Hallmarked. Excellent condition. Sterling silver dessert set with horse ornament. Made by Watson in Attleboro, Mass., ca. 1920. This set comprises 11 knives and 12 forks. Each handle has a horse’s head in roundel. The knives have stainless steel blades. The forks have 4 tines. Elegant and equestrian. Hallmarked. Excellent condition. 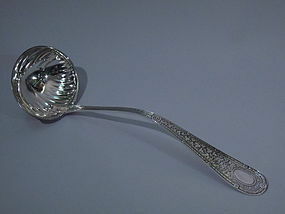 Sterling silver long-handled salad serving spoon and fork in Lap Over Edge pattern. Made by Tiffany, ca. 1885. Allover hand-hammering, a tapering handle, and applied ornament (fish and foliage on fork, foliage on spoon). The fork shank has a curvilinear bowl and 3 tines. The spoon has a crimped and scalloped bowl. Shank and bowl interior lightly gilt. 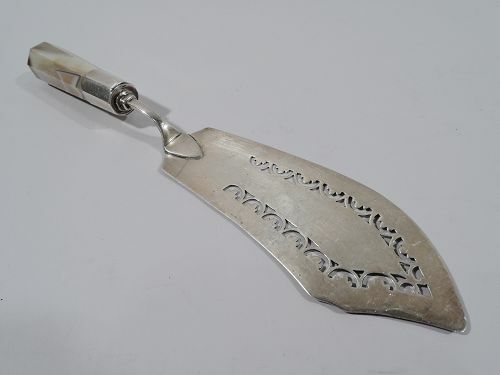 Sterling silver soup ladle in Laureate pattern. Made by Whiting. Oval and fluted bowl. Curved and tapering handle with leaves bordered by foliate border. Oval medallion (blank for monogram). Hallmarked. Excellent condition. 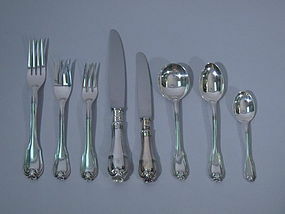 Set of sterling silver flatware in Borgia pattern. Made by Buccellati in Italy. This set comprises 110 pieces: 12 knives (9 in. ), 12 knives (8 in. ), 12 forks (8 in. 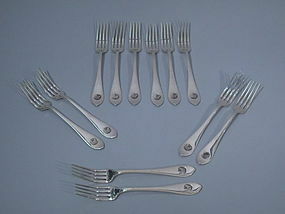 ), 11 salad forks (6 in. ), 12 pastry forks (6 in. 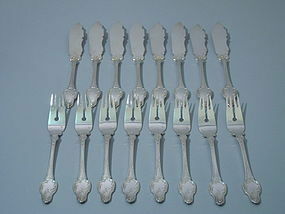 ), 12 oval soup spoons (6 in. ), 12 teaspoons ( 5 in. 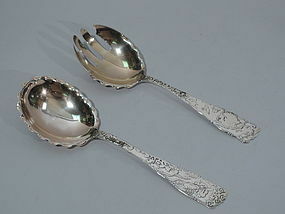 ), 12 dessert spoons (6 in. ), 4 fish forks (6 in. ), 4 fish knives (8 in. ), 4 butter knives (6 in. ), 1 master butter (8 in. 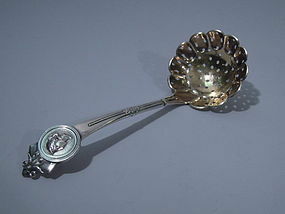 ), 1 sugar spoon (5 in. ), and 1 pickle fork (5 in. ).